May-Hegglin anomaly (MHA) is an autosomal dominant disorder characterized by various degrees of thrombocytopenia that may be associated with purpura and bleeding; giant platelets containing few granules; and large, well-defined, basophilic, cytoplasmic inclusion bodies in granulocytes that resemble Döhle bodies (see the image below). [1, 2, 3] MHA is one of a family of macrothrombocytopenias characterized by mutations in the MYH9 gene. [4, 5] The other members of this family include Sebastian syndrome,  Epstein syndrome,  and Fechtner syndrome,  although it is likely, as MYH9-related disorders are better characterized, that these time-honored eponyms will fade away. 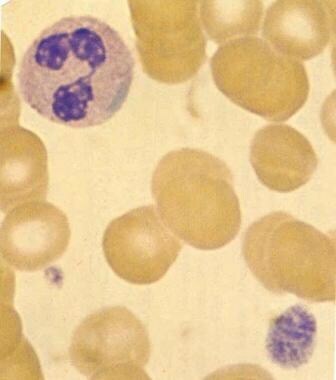 Blood smear (original magnification ×2000) in patient with May-Hegglin anomaly (MHA) demonstrates characteristic giant platelet with poorly defined granulation. Normal-sized platelet is also present. Trilobed neutrophil contains large, well-defined, basophilic, peripherally placed cytoplasmic inclusion body (resembling Döhle body). Image used with permission from Little, Brown. It is important to look for associated clinical features of other MYH9-related disorders (ie, Sebastian syndrome, Epstein syndrome, Fechtner syndrome). The following findings may be noted in these syndromes, which may overlap depending on the underlying mutation. Most patients with MHA do not have clinically significant problems with bleeding and therefore do not require treatment. Leukocyte Döhlelike inclusion bodies are visualized on standard Wright stain and appear bright blue and spindle-shaped. Ultrastructural studies reveal that these bodies consist of clusters of ribosomes oriented along parallel myosin heavy-chain filaments 7-10 nm in diameter. Neutrophil function is considered to be normal, and patients have no increased susceptibility to infections. May-Hegglin anomaly is one of a family of macrothrombocytopenias characterized by mutations in the MYH9 gene, which is present at chromosomal region 22q12-13 and codes for nonmuscle myosin heavy-chain IIA. The Döhlelike leukocyte inclusions in MHA are due to precipitation of myosin heavy chains in leukocytes. MHA is a rare autosomal dominant disorder. In one review, 180 cases had been reported in the literature. Kindreds have been reported from Italy, France, Germany, and North America. MHA was reported in 15 families in Japan in 1993. The exact incidence of the syndrome is unknown. Individuals with MHA should be informed regarding their personal risk of bleeding. They should be made aware that their bleeding risks are associated with the degree of thrombocytopenia. In patients who are scheduled to undergo surgical procedures or have sustained trauma, the diagnosis of MHA must be discussed because special precautions and procedures may be required to prevent bleeding complications. Individuals with MHA should be educated to avoid drugs (eg, aspirin) that can adversely affect platelet function. Fatima S. May hegglin anomaly: rare entity with review of literature. Indian J Hematol Blood Transfus. 2012 Mar. 28 (1):58-60. [Medline]. [Full Text]. Untanu RV, Vajpayee N. May Hegglin Anomaly. StatPearls. 2018 Jan. [Medline]. [Full Text]. Noris P, Pecci A. Hereditary thrombocytopenias: a growing list of disorders. Hematology Am Soc Hematol Educ Program. 2017 Dec 8. 2017 (1):385-99. [Medline]. Seri M, Cusano R, Gangarossa S, et al. Mutations in MYH9 result in the May-Hegglin anomaly, and Fechtner and Sebastian syndromes. The May-Heggllin/Fechtner Syndrome Consortium. Nat Genet. 2000 Sep. 26(1):103-5. [Medline]. Wang Y, Liu S, Zhang Y, Yang J. Myosin Heavy Chain 9: Oncogene or Tumor Suppressor Gene?. Med Sci Monit. 2019 Jan 31. 25:888-92. [Medline]. Greinacher A, Nieuwenhuis HK, White JG. Sebastian platelet syndrome: a new variant of hereditary macrothrombocytopenia with leukocyte inclusions. Blut. 1990 Nov. 61(5):282-8. [Medline]. Epstein CJ, Sahud MA, Piel CF, Goodman JR, Bernfield MR, Kushner JH. Hereditary macrothrombocytopathia, nephritis and deafness. Am J Med. 1972 Mar. 52(3):299-310. [Medline]. Peterson LC, Rao KV, Crosson JT, White JG. Fechtner syndrome--a variant of Alport's syndrome with leukocyte inclusions and macrothrombocytopenia. Blood. 1985 Feb. 65(2):397-406. [Medline]. Saito H, Kunishima S. Historical hematology: May-Hegglin anomaly. Am J Hematol. 2008 Apr. 83(4):304-6. [Medline]. Kunishima S, Kojima T, Tanaka T, et al. Mapping of a gene for May-Hegglin anomaly to chromosome 22q. Hum Genet. 1999 Nov. 105(5):379-83. [Medline]. Chen Z, Shivdasani RA. Regulation of platelet biogenesis: insights from the May-Hegglin anomaly and other MYH9-related disorders. J Thromb Haemost. 2009 Jul. 7 Suppl 1:272-6. [Medline]. Burns ER. Platelet studies in the pathogenesis of thrombocytopenia in May-Hegglin anomaly. Am J Pediatr Hematol Oncol. 1991 Winter. 13(4):431-6. [Medline]. Mayer K, Schildknecht O, von Felten A. [May-Hegglin anomaly: further studies on thrombocyte dysfunction]. Schweiz Med Wochenschr. 1997 Jun 28. 127(26):1134-40. [Medline]. Noris P, Spedini P, Belletti S, et al. Thrombocytopenia, giant platelets, and leukocyte inclusion bodies (May- Hegglin anomaly): clinical and laboratory findings. Am J Med. 1998 Apr. 104(4):355-60. [Medline]. Pujol-Moix N, Kelley MJ, Hernandez A, Muniz-Diaz E, Espanol I. Ultrastructural analysis of granulocyte inclusions in genetically confirmed MYH9-related disorders. Haematologica. 2004 Mar. 89(3):330-7. [Medline]. Heath KE, Campos-Barros A, Toren A, Rozenfeld-Granot G, Carlsson LE, Savige J. Nonmuscle myosin heavy chain IIA mutations define a spectrum of autosomal dominant macrothrombocytopenias: May-Hegglin anomaly and Fechtner, Sebastian, Epstein, and Alport-like syndromes. Am J Hum Genet. 2001 Nov. 69(5):1033-45. [Medline]. Otsubo K, Kanegane H, Nomura K, Ogawa J, Miyawaki T, Kunishima S. Identification of a novel MYH9 mutation in a patient with May-Hegglin anomaly. Pediatr Blood Cancer. 2006 Dec. 47(7):968-9. [Medline]. Seri M, Pecci A, Di Bari F, et al. MYH9-related disease: May-Hegglin anomaly, Sebastian syndrome, Fechtner syndrome, and Epstein syndrome are not distinct entities but represent a variable expression of a single illness. Medicine (Baltimore). 2003 May. 82(3):203-15. [Medline]. Dong F, Li S, Pujol-Moix N, et al. Genotype-phenotype correlation in MYH9-related thrombocytopenia. Br J Haematol. 2005 Aug. 130(4):620-7. [Medline]. Kunishima S, Yoshinari M, Nishio H, Ida K, Miura T, Matsushita T. Haematological characteristics of MYH9 disorders due to MYH9 R702 mutations. Eur J Haematol. 2007 Mar. 78(3):220-6. [Medline]. Aoki T, Kunishima S, Yamashita Y, Minamitani K, Ota S. Macrothrombocytopenia With Congenital Bilateral Cataracts: A Phenotype of MYH9 Disorder With Exon 24 Indel Mutations. J Pediatr Hematol Oncol. 2018 Jan. 40 (1):76-8. [Medline]. Ishii A, Honnma T, Ishida M, Sano F, Hamada H, Takayanagi M. Pregnancy complicated by the May-Hegglin anomaly. J Perinat Med. 1993. 21(3):247-52. [Medline]. Sehbai AS, Abraham J, Brown VK. Perioperative management of a patient with May-Hegglin anomaly requiring craniotomy. Am J Hematol. 2005 Aug. 79(4):303-8. [Medline]. Antonio G, Silvia V, Emanuela B, Fabrizio F. Thrombotic events in MYH9 gene-related autosomal macrothrombocytopenias (old May-Hegglin, Sebastian, Fechtner and Epstein syndromes). J Thromb Thrombolysis. 2011 Nov. 32(4):474-7. [Medline]. Hussein BA, Gomez K, Kadir RA. May-Hegglin anomaly and pregnancy: a systematic review. Blood Coagul Fibrinolysis. 2013 Jul. 24 (5):554-61. [Medline]. Fixter K, Rabbolini DJ, Valecha B, et al. Mean platelet diameter measurements to classify inherited thrombocytopenias. Int J Lab Hematol. 2018 Apr. 40 (2):187-95. [Medline]. Kamath V, Gnanasekaran KK, Mammen J. MYH9-related disorder, a probable May-Hegglin anomaly case series: A tertiary care experience. Hematol Oncol Stem Cell Ther. 2016 Dec. 9 (4):137-40. [Medline]. [Full Text]. Kunishima S, Matsushita T, Kojima T, Sako M, Kimura F, Jo EK. Immunofluorescence analysis of neutrophil nonmuscle myosin heavy chain-A in MYH9 disorders: association of subcellular localization with MYH9 mutations. Lab Invest. 2003 Jan. 83(1):115-22. [Medline]. Rabbolini DJ, Chun Y, Latimer M, et al. Diagnosis and treatment of MYH9-RD in an Australasian cohort with thrombocytopenia. Platelets. 2017 Nov 1. 1-8. [Medline]. Bizzaro N. May-Hegglin anomaly and uncomplicated vaginal delivery: a report of 41 cases. Am J Obstet Gynecol. 1999 Jul. 181(1):226-7. [Medline]. Chabane H, Gallais Y, Pathier D, Tchernia G, Gaussem P. Delivery management in a woman with thrombocytopenia of the May-Hegglin anomaly type. Eur J Obstet Gynecol Reprod Biol. 2001 Nov. 99(1):124-5. [Medline]. DiMichele DM, Hathaway WE. Use of DDAVP in inherited and acquired platelet dysfunction. Am J Hematol. 1990 Jan. 33(1):39-45. [Medline].